Editor’s note: Matt read this short story to Mrs. Fryar’s 1st period class last week. 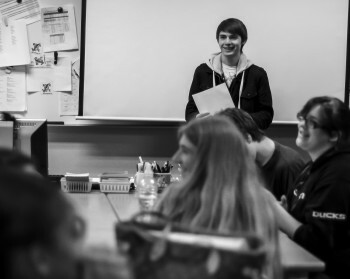 The class erupted into uproarious applause and celebration. We re-enacted Matt’s victory lap in the above photo. Everything in my head was fuzzy when I was woken up by a strange ringing sound. My eyesight was blurry when I struggled to open my eyelids, so I took my hands and rubbed them for more clarity. When I became aware of what was going on, and when I could feel all five senses, the first thing I realized was how tired I was. My eyes didn’t want to wake up, they kept trying to force their way shut, and at one point I thought I heard them say, “shhh, it’s okay, just go back asleep…” but I built up the strength to keep them open. I peered around to find out what that ringing noise was when I realized that my phone was chiming on my night stand next to me. Who’s calling me this late? I thought, it better not be another telemarketer or I’m going to scream. But when I picked it up it read, ‘Kaila calling…’, and when I looked at the time, it was 1:13 a.m. Why is Kaila calling me this late? I clicked the answer button and held the phone up to my ear. “Hello?” I asked in a grungy, tiresome voice. “What?” I was confused on what was happening at the moment since I only got about two-and-a-half hours of sleep. Kaila didn’t sound scared or freaked out over the phone, so I knew it probably wasn’t bad. She actually sounded quite ecstatic from the tone in her voice. “Just come outside, Sleepyhead.” The phone hung up on the other end. I decided to get up rather than get the extra seven hours of sleep I desperately needed, and when I say desperately, I mean that I had to train someone for work the next day, and we had a meeting about very important issues and I needed to be on high alert and focused. But I just thought, well, I guess I can go out in the middle of the night, not get my sleep, be a rebel, and possibly risk my job. Yeah, that sounds great. I threw the covers off of me and stretched out my muscles before I dragged my feet to the closet and put on a white shirt. I was so tired, I had to actually make the effort of putting on the shirt, I nearly stuck my head through one of my short sleeves, which in front of somebody would be really embarrassing. I already had pajama bottoms on, and I didn’t think we were going someplace where I needed pants, so what was the point of pants? And since we were going outside, I slipped on my pair of moccasins so my feet could feel warm and cozy in the cold Washington night. When I opened the door to the hallway aligned with the doors to the other apartments, I saw Kaila’s bedhead of long, blonde hair, restless emerald eyes, no makeup covered face, wearing a pajama bottoms and a tank top, and a smile that–if you saw her–would make you think that she was a little girl scout selling you her cookies. My eyes squinted because of the blazing sun bright hall light, but even in tunnel vision she looked damn gorgeous. “Nope, this is way better, more fun, and it wakes you up too.” she interrupted. Huh, I thought exercise was supposed to make you tired. “Not on the street: the roof.” she exclaimed as she interrupted me a second time. “Nope, it’s a surprise, just wait.” she said, interrupting me a third time. I decided that I’d keep my mouth shut as she pulled me up the stairs. I started pondering about what it was she was going to show me on the roof. A thought in my head scared me about it, but only a little. Once we got to the top of the stairs, I saw that there was a jam in the door to the roof that kept it from being closed. Kaila took out the jam and swung the door open, and gently pulled me through. “Wait.” I said, trying to catch my breath. She had so much energy, I had no idea how I could keep up with her. She was at the top of the stairs with breaths that still entered and exited her lungs at an average pace, while I slumped over, hands on my knees, and my lungs pleading for oxygen. “No… I just… don’t run often…” I replied while huffing and puffing the air in and out. After regaining my normal breaths, I stood up, took one good, deep breath, stared up, and lost myself in the night sky. I’ve never seen a more beautiful night where the stars were friendly with each other, spaced out not too far but not too close, and twinkling as if exchanging conversation and laughing with one another. Some stars were so clumped that they formed a bright blue galaxy that glittered and glowed evermore magnificently. I was so mesmerized by the stars that I didn’t even notice when Kaila stepped in front of me, not even a half-a-foot away, and said, “Amazing isn’t it?” Prior to that I leaped into the air because of how unexpected it was for to be right there, and I almost stumbled off the edge of the roof which internally killed me inside and left me screaming like a five-year-old because of how deathly afraid of heights I am. I decided to sit down up against the ledge after that incident to take a few moments to recover from the major panic attack I was having because of what just happened. Breathing became hard because of the anxiety from that moment, it felt like somebody took a firm grip of my lungs and squeezed the air out with every breath I took. I hated these things. I hated the way they made me feel inside: the major body pain that occurred after the heavy breathing, the racing train of thoughts that never ended no matter how much I tried to clear my mind. Kaila sat down right next to me, back against the stone ledge. “Hey,” she said, “are you okay?” She sounded concerned. Hearing her made me calm down a little bit, it always seemed like she made everything… better, in my life. Ever since she moved in two apartments over from mine, everything in my life seemed so much… better in general. And her always being here with me, and for me, made me feel less lonely, and more happy. I had someone to talk to without being judged or bullied, or feel awkward and gawky around. I felt like me around her, not the stupid, geeky, overwhelmed and shy me–which was always me around her–but I felt like my own self. “I’m afraid of heights.” I mumbled. “Well that explains things.” she said in a jokingly fashion. We sat there for a minute or so in silence–silence being the ambiance of cars and the slight, quiet whisper of the wind. I felt Kaila place her hand on my back and start rubbing softly up and down, and it made me want to fall asleep because of how good it felt, and how relaxed I became. The pain, the hard breathing, the racing train of thoughts, they all went away as soon as she started caressing me. I corrected my posture and lifted my back to make it straight, then leaned my head against the ledge. She couldn’t rub my back anymore, but since I was more relaxed, it was okay. I took a couple deep breaths. “Yeah,” I said, “well, not necessarily, I’m more afraid of falling down than just heights. Then again, who isn’t afraid of falling.” I saw Kaila staring at me in my peripheral vision, so I slowly turned my head to stare back. She was grinning in such a way that it almost scared me: partially squinted eyes, biting her bottom lip. “What?” I said. “I think I can solve your problem.” she told me. She sounded quite excited, and a slight bit assuring, but I was a little skeptical. “And how is that?” I questioned. Kaila jumped up onto her feet and reached her hand out to help me up. “Lemme show you something.” she said. Our hands met and she pulled me up off the ground. Keeping a hold of my hand, she pulled me towards the… ledge… Oh, hell take me. “Nope!” I shouted, ripping my hand away from hers and storming towards the the door to head back down to my apartment and go to bed. I was not going near any ledge after the incident I had about ten minutes ago. “I will not!” I said. “Please?” she said to me as she imitated a pouty face. “No, that is not happening again, no way, uh uhh.” I said stubbornly. Kaila sat on the ground, crossing her legs and letting her head hang like she was a little kid. She started playing with pieces of rubble from the ground and tossed a couple at my feet as if indicating that I was no fun. Her pretending to pout like a little girl who got her candy taken away was way too adorable for me, and for some reason it made me feel like the person who took that candy away from her. I didn’t know what it was, but something in my head was telling me not to be such a buzzkill and just live a little. “Alright,” I said, sighing out of guilt, “lead me.” Kaila immediately hopped onto her feet, growing that cheerful smile and eccentric attitude back, and started walking me to the ledge. I started getting a little frightened just taking little baby steps over there. “I think the only way to overcome that fear of yours, is to embrace it.” she told me. She was trying to be so calm about the situation, but God knows I was not going to be anywhere close to the word ‘calm’. I felt the adrenaline start to kick in, my blood bouncing around inside of me. My mind was shouting, Stop! Don’t do it! You’re a mad man!, but I shook my head and–with the biggest, and loudest gulp I’ve ever taken–stepped slowly onto the ledge, not looking down for a second, or even a fragment of a second, and slowly, and softly, and carefully… sat down. “Hey,” Kaila spoke, as calm as the whisper of the wind was, “relax.” She held my hand not too firm, but not too soft either, telling me that there’s nothing to be afraid of. And she was right, there wasn’t anything to be afraid of. All I was doing was just sitting on a ledge with a beautiful girl over the beautiful city of Seattle, under a magnificent galaxy-drawn night sky. I turned to her and looked dead straight into those dazzling, emerald green eyes. I didn’t, and wouldn’t look away, not even for a fragment of a second. My eyes were glued to hers as much as hers were glued to mine. My heart was pumping fast now, not because of my phobia anymore, but because of that moment we were sharing together that I couldn’t even describe with any word from the dictionary. I didn’t pay attention to the street below where our feet were hanging above, nor anything around us for that matter. I was just awestruck by the shade of green in her eyes, the hairpin curve of her lips, the plush yet subtle gentleness of her cheeks. I didn’t know if it was the luminance of the street lights below us or the burning passion of wanting to kiss her, but every bit and piece of her kept drawing me closer, and closer, and my head started leaning towards hers. I thought it was stupid of me for leaning in, and I knew she saw that I was because she glanced at my lips the second that I started. But, I only thought that she was going to pull away, and I didn’t know why, so I slowed down, and I stopped. “No,” I heard her whisper, and she threw her arms around my neck and planted her lips onto mine. I could taste the sweet strawberry of her chapstick, her favorite kind. I could feel the warmth from the tip of her nose touching my brisk skin, and the tight embrace she pulled me into closer and closer. We started falling backwards, but even if we were going to fall forward off the building, I wasn’t scared at all. I wasn’t scared because if I were to fall into oblivion, it would only be with her. Even though were were falling backwards onto the rooftop ground, which was only about a foot, that kiss made the entire moment last for hours, and I wanted to fall forever with her.